Election Translation? It’s Easy If You Plan for It! As an elections professional, you have a wide variety of regulations you need to keep in mind as you look towards translating your documents for the next election. Regardless of your goals surrounding language access and voter turnout, understanding what documents are vital for election translation can help to ensure those goals are met. 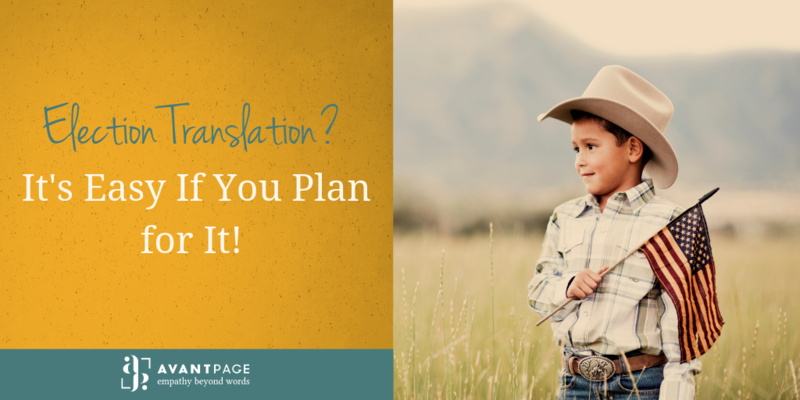 While each county has different threshold languages and may require different language services in addition to translation, having these documents standardized can promote the success of your language goals. While translating for your threshold languages is legally mandated, many counties choose to expand the number of languages they translate their documents into even further. If there’s a growing language community in your area, it may be worth translating your documents into that language to promote access and increase voter turnout. Additionally, talking to the language communities in your district can help you to understand the efficacy of your translations, and whether they’re providing access in the way you would like them to. If you’re starting a new election translation project, or want to ensure that you’re prepared before the next election, we can help. From determining your threshold languages to which documents you need to translate, we’ve managed a wide variety of election translation projects for over 20 years. Call us at 530-750-2040 or request a free quote today, and start a partnership with a Language Service Provider you can trust.